Coming off a road sweep of Pacific and Saint Mary’s last week, the Zags were rewarded with a No. 12 ranking in the USA Today/WBCA Coaches Poll. 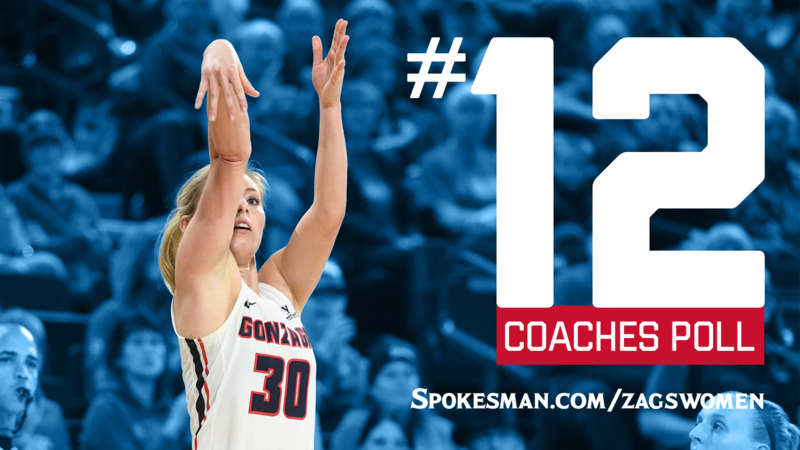 The ranking marks GU’s highest in either the coaches or Associated Press media poll. On Monday, the Zags were ranked 13th in the AP poll. Gonzaga is 21-2 overall and 10-1 in the West Coast Conference after beating Pacific 63-51 on Thursday and Saint Mary’s 66-52 two days later. As of Tuesday, Gonzaga is one of six teams in the nation with 21 wins. Coupled with two losses by BYU, the sweep put the Zags alone in first place going into Saturday’s WCC game at Portland. GU is back home Feb. 14 against San Diego and Feb. 16 against BYU. Published: Feb. 5, 2019, 4:47 p.m. Updated: Feb. 5, 2019, 10:37 p.m.